Someone said that the number 1.8393... is considered the "worst" irrational number, having something to do with being the most immune to common factoring. I found 1.8393... in this paper https://arxiv.org/pdf/1604.00308.pdf "The two-dimensional density of Bernoulli Convolutions" by Christoph Bandt. 1.8393... is a solution to x3 - x2 - x1 -1 =0 and is the Tribonacci constant Tau, which is the limit (as N goes to infinity) of the ratio of adjacent terms (that is, the growth rate) of the Tribonacci numbers, which are given by the recurrence relationship Tn = Tn-1 + Tn-2 + Tn-3. http://oeis.org/A058265 http://mathworld.wolfram.com/TribonacciNumber.html Tau is thus analogous to Phi, the Golden Ratio, which is the analogous limit for the Fibonacci numbers. 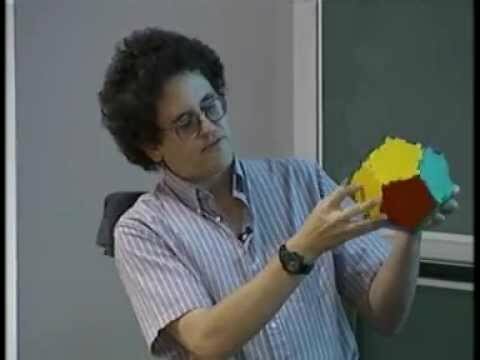 John Baez explains how Phi can be considered "the worst irrational number" in his video on the number 5, which I enjoyed very much. The argument there was that the continued fraction for Phi is 1 / (1 + 1/(1 + 1/(1 + 1/ ....) whereas good approximations for real numbers in terms of the rational numbers occur at those points where the integer is a large term. Here "good approximation" means "preciseness of approximation / smallness of numerator and denominator". For example, the continued fraction for Pi is given by [3; 7, 15, 1, 292, 1, 1, 1, 2, 1, 3, 1, 14, 2, 1, 1, 2, 2, 2, 2, ...] namely 3 + 1/(7 + 1/(15 + 1/(1 +1/(292 + 1/(1 +....) and so there will be great approximations if we stop at 7, at 15 or especially, at 292. For example 3 + 1/7 = 22/7 is a famous approximation for Pi. But there can be other or better ways in which Tau is the worst irrational number. It seems another way is related to the Markov spectrum https://en.wikipedia.org/wiki/Markov_spectrum and the Lagrange numbers https://en.wikipedia.org/wiki/Lagrange_number Apparently, if we remove the worst irrational Phi and related numbers, then the worst irrational becomes Square Root of Two. Then we can similarly keep removing the worst irrationals and we get a sequence of Lagrange numbers which converges to 3. There is a paper http://iml.univ-mrs.fr/~ferenczi/lagiet.pdf on "Dynamical Generalizations of the Lagrange Spectrum" which starts out by noting that this "artithmetic" definition of the Lagrange numbers can be replaced by a dynamical definition on the irrational rotations of angle Alpha coded using the continued fraction 1/(Alpha + 1/(Alpha + 1/(Alpha + 1/ .... where now Alpha is a real number and not just an integer, if I understand correctly. Then the paper draws conclusions about the Arnoux-Rauzy system and the Tribonacci numbers. The paper https://www.irif.univ-paris-diderot.fr/~steiner/balanced.pdf "Balance properties of Arnoux-Rauzy words" by Valerie Berthe, Julien Cassaigne, Wolfgang Steiner, discusses "infinite words with low factor complexity", which perhaps relates to what you heard. The Tribonacci word is discussed in this paper. Great talk on the number 5, by John. I like this natural way of talking about mathematics. Comment Source:Nice material, thanks Andrius. Great talk on the number 5, by John. I like this natural way of talking about mathematics. Towards the end of John's talk he mentions the strange impact of invoking two cycles instead of one cycle. 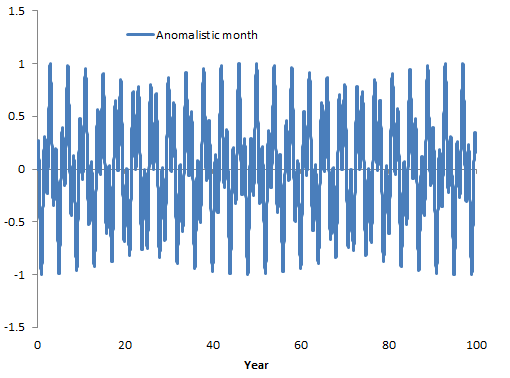 A similar strangeness occurs when I am trying to model ENSO. Combining a yearly periodic signal with shorter period naturally invokes a period doubling or biennial modulation. 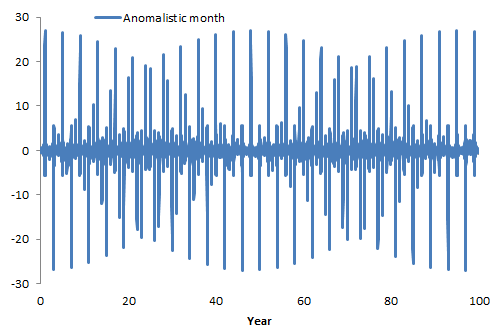 This is related to the mathematical simplification relating seasonal aliasing of short-period cycles with a biennial signal. This is enough to create a new aliased cycle that is simply the original frequency $\omega_L$ summed with an infinite series of that frequency shifted by multiples of $2\pi$. This was derived in a previous post. So as a concrete example, the following figure is a summed series of f(t) -- specifically what we would theoretically see for an anomalistic lunar month cycle of 27.5545 days aliased against a yearly delta. If you count the number of cycles in the span of 100 years, it comes out to a little less than 26 cycles, or an approximately 3.9 year aliased period. If a low-pass filter is applied to this time series, which is likely what would happen in the lagged real world, a sinusoid of period 3.9 years would emerge. where the function "int" truncates to the integer part of the period reciprocal. Since $T_L$ is shorter than the yearly period of 1, then the reciprocal is guaranteed to be greater than one. As a check, if we take only the first biennial term of this representation (ignoring the higher frequency harmonics) we essentially recover the same time series. What is interesting about this factoring is that a biennial modulation may naturally emerge as a result of yearly aliasing, which is possibly related to what we are seeing with the ENSO model in its biennial mode. Independent of how many lunar gravitational terms are involved, the biennial modulation would remain as an invariant multiplicative factor. The other connection with John's talk is that modulation of one sinusoid with another is similar to a continued fraction. If these modulations are continued, then the periods can split again, much like a continued fraction. This works if T = 2, which reinforces the biennial cycle.